In Tableau Server you will configure Trusted Authentication. The steps for doing this are covered in this article. 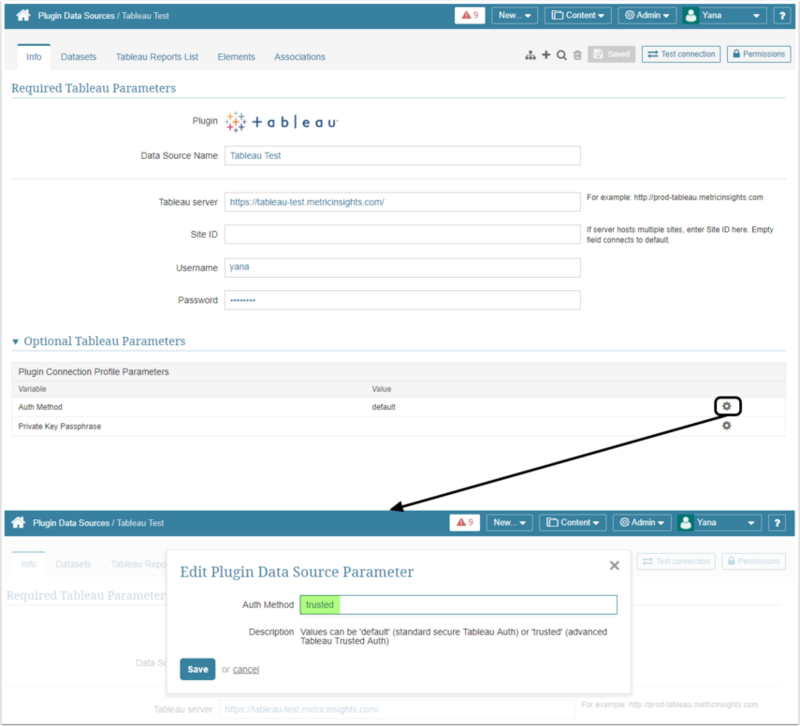 Trusted authentication simply means that you have set up a trusted relationship between Tableau Server and the Metric Insights. When Tableau Server receives requests from Metric Insights, Tableau assumes the credentials of the Metric Insights user. For more detailed information on Trusted Authentication in Tableau Server, refer to the Tableau Server Administration Guide. To use Tableau Trusted Auth, each Username created on Metric Insights must have an identical Username in Tableau Server. For example, if you sign in with Username 'Mary Jane' in Metric Insights, then to be able to sign on to Tableau server you must also have the Username 'Mary Jane' in Tableau server. You only need to do this for versions of Tableau server 8.0 and prior. For Tableau server 8.1 and beyond, you can use the fully qualified domain name of the Metric Insights instance. Use Tableau Server command line utilities to add Metric Insights IP address (or fully qualified domain name for Tableau server 8.1 and beyond) to list of trusted sites. D:\Tableau\Tableau Server\10.1\bin> .\tabadmin.bat set wgserver.trusted_hosts "10.146.246.13, 10.192.61.233"
D:\Tableau\Tableau Server\10.1\bin> .\tabadmin.bat set wgserver.trusted_hosts "mi-dev.mycompany.com, mi-prod.mycompany.com"
In the curl request, supply the username (e.g., 'admin') and the url of Tableau server (e.g., https://tableau-test.metricinsights.com/trusted/). Any of the above curl request arguments should work. 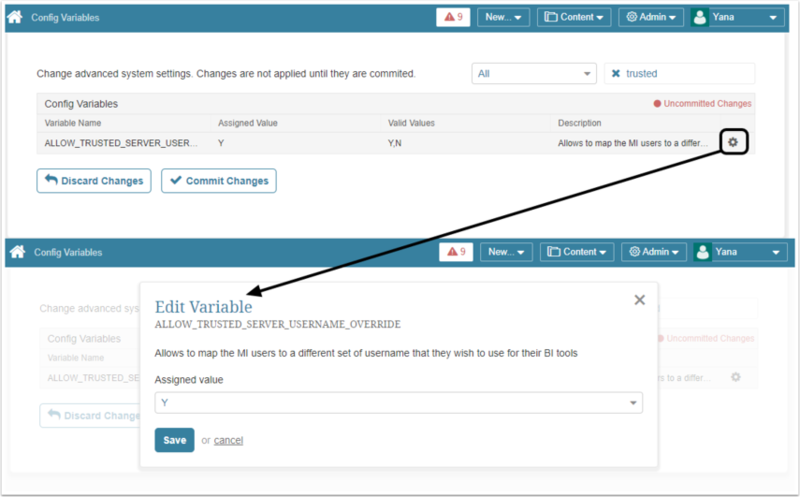 Assign the "Y" Value to the ALLOW_TRUSTED_SERVER_USERNAME_OVERRIDE Variable to let MI Users be mapped to licensed Tableau Users. 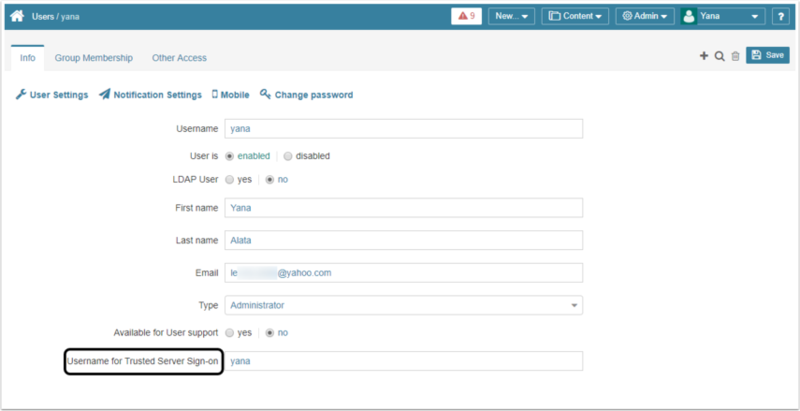 Configure Auth method to be "trusted"
In the Report Type field choose Add New Report Type from the drop-down list. Then choose Tableau Single-Sign in the Drill-Down Authentication field. 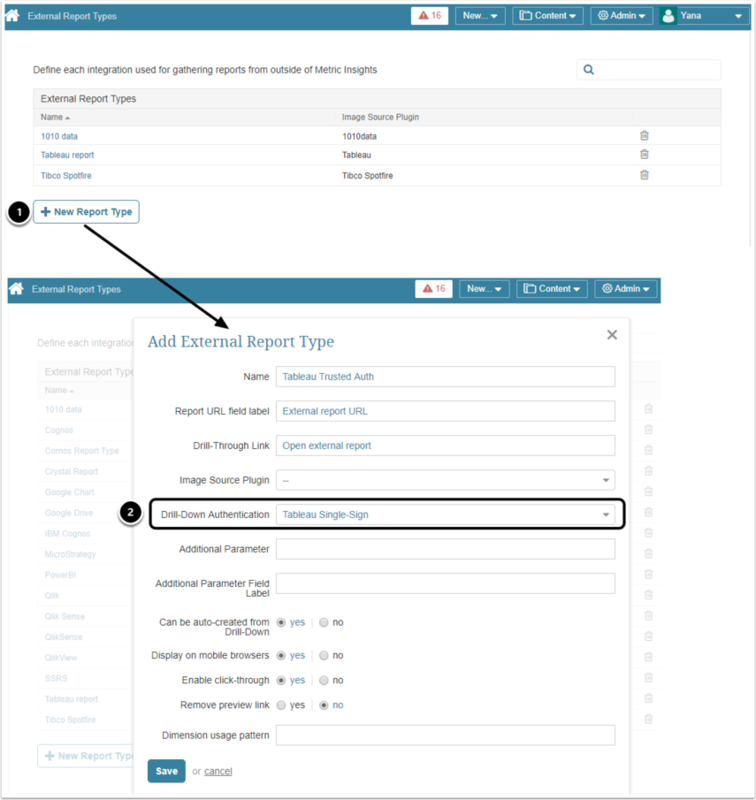 NOTE: If you already have an existing External Report Type defined for Tableau, you can enable authentication for all reports associated with this type by modifying the Drill Down Authentication setting to Tableau Single-Sign.